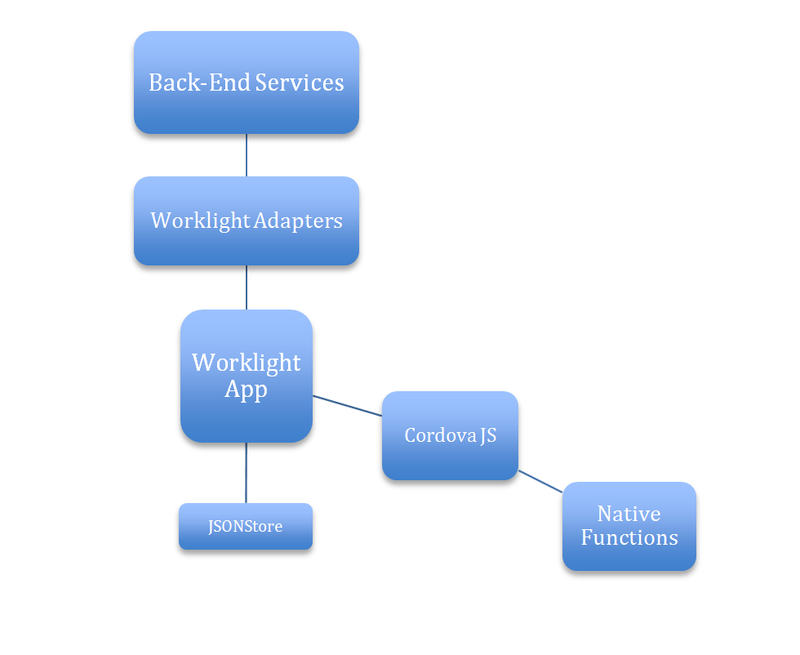 Worklight is an open, comprehensive and advanced mobile application platform and framework used to develop HTML5, hybrid and native mobile applications. 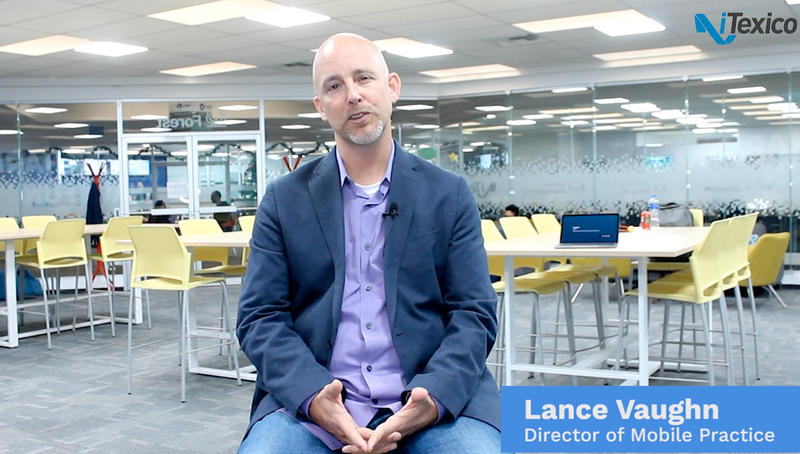 Worklight also helps run and manage these software mobile applications. IBM Worklight Device Runtime Components. This is a plugin for Eclipse IDE that allows us to develop the code for the app. 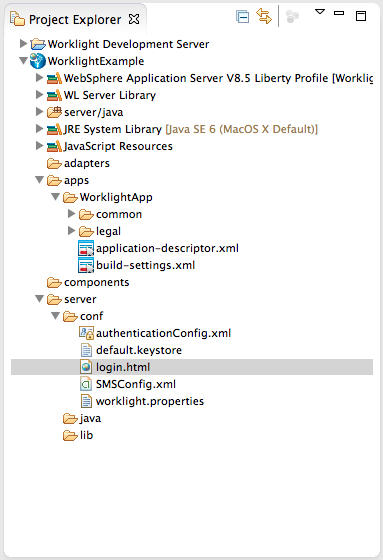 All of these components are the SDK. This will make the code we write to work on the user's real devices. This is the server that provides the information to the application, based on adapters’ paradigm. It gets the data access to the back-end of the app. This is the monitor and manager of the app in its different versions and environments, adapters and push notification rules. Provides the API that allows local JSON data storing. An adapter is a component that is used to retrieve the data from services in the back-end server. The retrieved data by the adapter is always JSON formatted. An XML file describing the back-end server information and the procedures that it performs. An XSL file, if the retrieved data from the back-end server is in XML format, the XSL file is used for the XML to JSON conversion. The adapter can be used to make HTTP requests, execute SQL queries and more. First, you have to download and install the IDE called Eclipse. Warning! 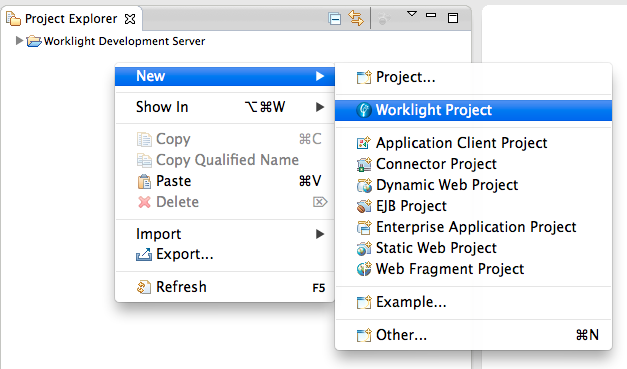 The Worklight documentation does not demand very specific version of the IDE in every version of the eclipse. By the time this blog is published, IBM Worklight 6 will be the latest release and it will demand Eclipse Juno v4.2.2 (SR2) or Eclipse Classic v4.2.2. You can download it the latest release here. 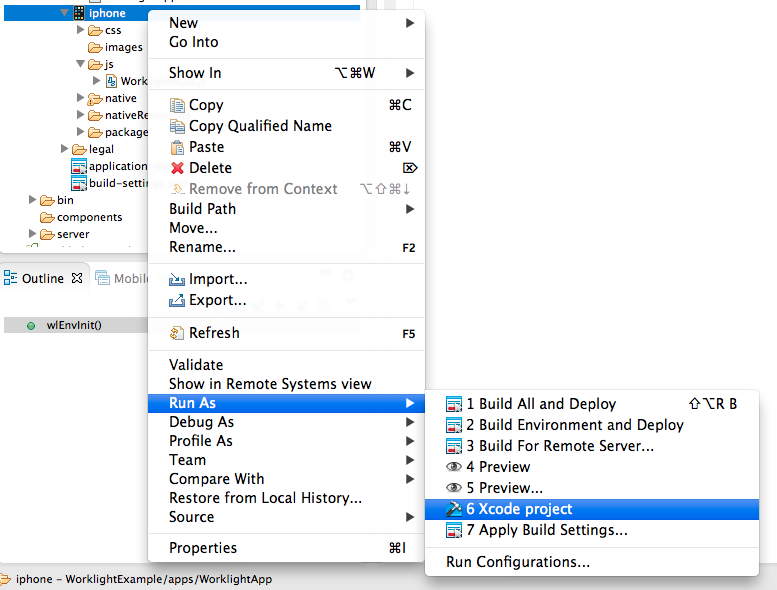 The next step is to download the IBM Worklight Developer Edition Plugin from the Eclipse Marketplace. NOTE: You should not forget to install the SDK of each environment in which you want to deploy. 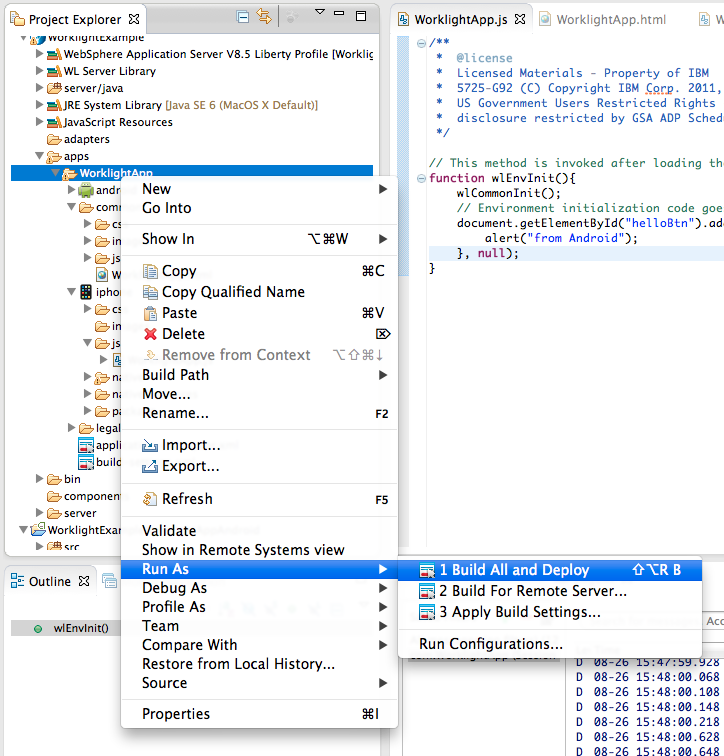 As you can see in the screenshot, the dojo library comes with the IBM Worklight 6 Plugin. NOTE: We will NOT add any library for this example. Adapters: Source code for the adapters. Apps: Source code for the apps. Server: Configuration files, libraries and Java code for the server. Components: Source code for the Shell components. 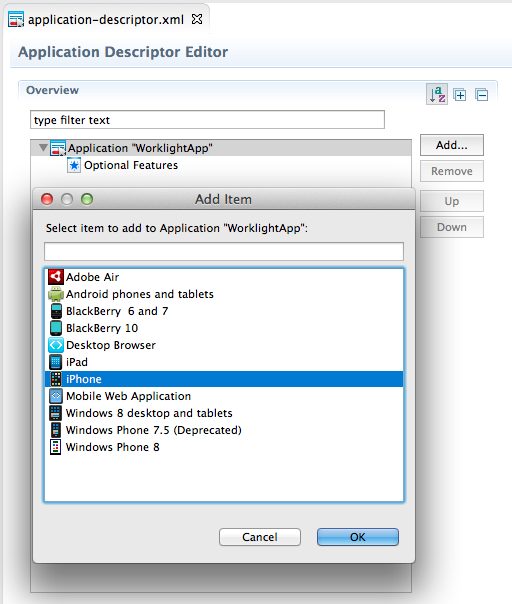 In the apps→WorklightApp→application-descriptor.xml file is where you can add environments and features to your app. 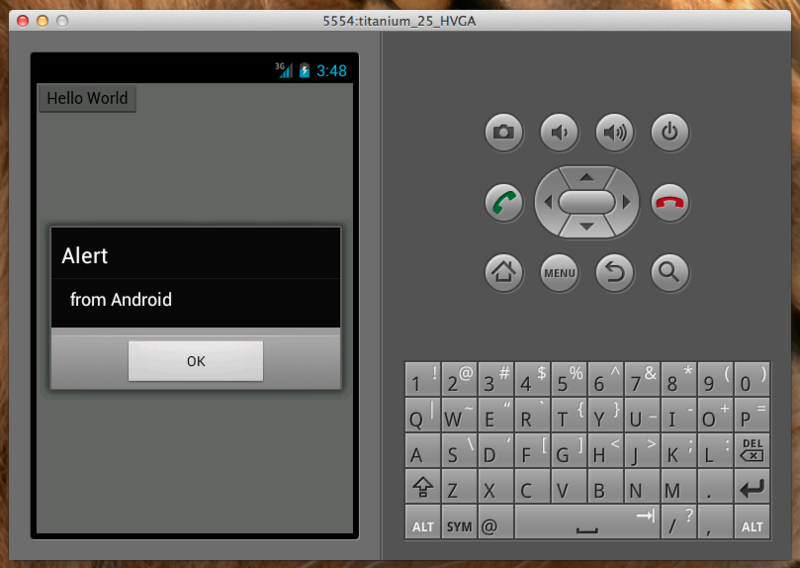 In this example, we'll add iPhone* and android environments. *Note: iPhone or iPad, only if you have a Mac. There are new folders under apps→WorklightApp folder, one by each environment you have added one as a common resource. 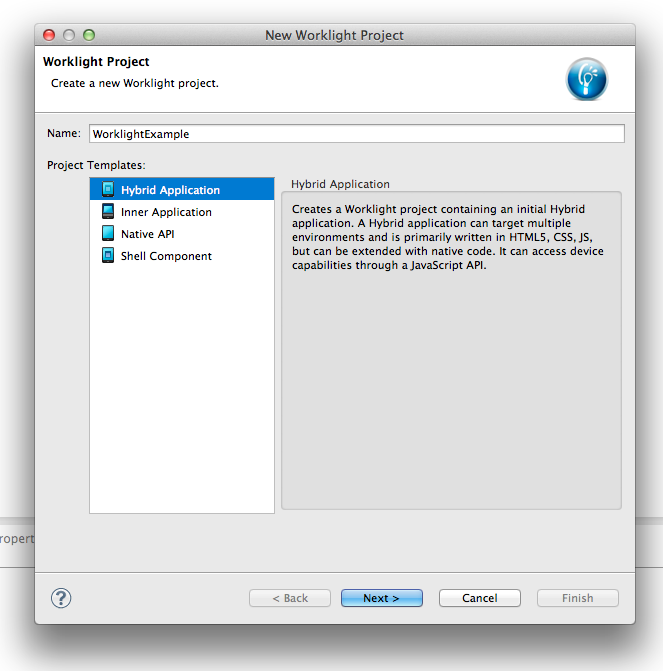 Now, in your workspace you can see a new Project (an Android App Project) named WorklightExampleWorklightAppAndroid. 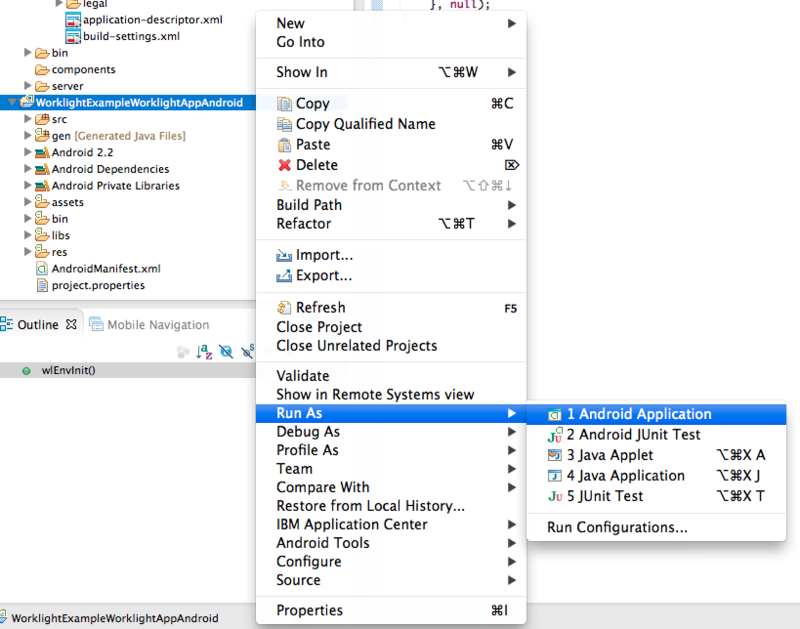 This is the result of the deployment for Android, selecting and running it as an Android Application will compile the app and load it into an emulator or a device. 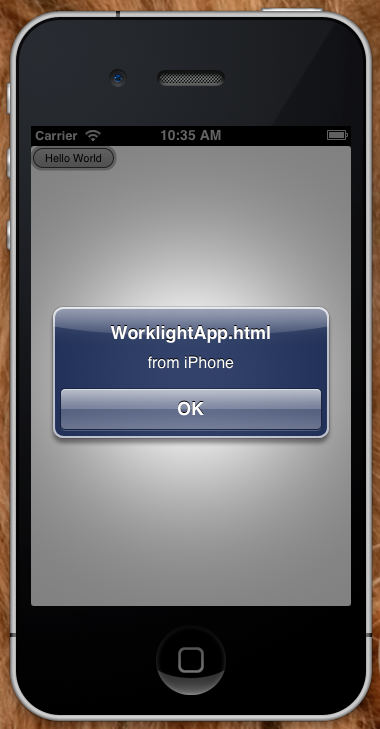 In the case of iPhone, Worklight will also create an Xcode Project for you. 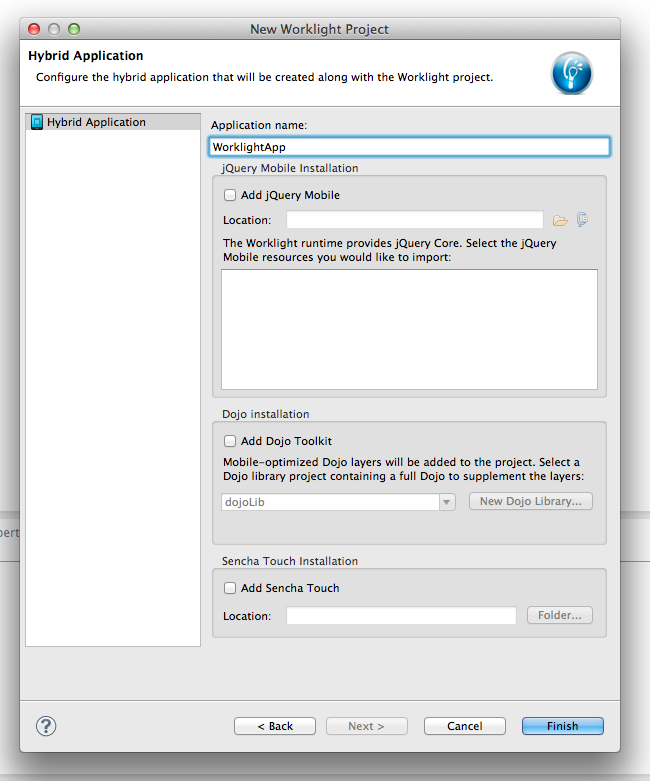 To open it, you must go to the iPhone environment folder inside your Worklight Project, right click on it and run it as Xcode Project, and then you can run the app from Xcode IDE. Adalberto Gonzalez is an experienced Systems Engineer which currently works at iTexico as a Mobile Developer. Adalberto has been specializing in Worklight since early 2013 additional to the regular platforms for development.